For over 40 years, this Astonish cleaning products range has been manufactured to the highest standard, placing a strong emphasis on supporting local raw material/packaging suppliers. Not only are their cleaning products highly effective and simple to use, they are also ethically sound. Astonish are proud to be approved by Cruelty Free International and the Vegetarian Society as well as being Vegan Society registered. Astonish products contain no animal ingredients or animal derivatives and have never been tested on animals. 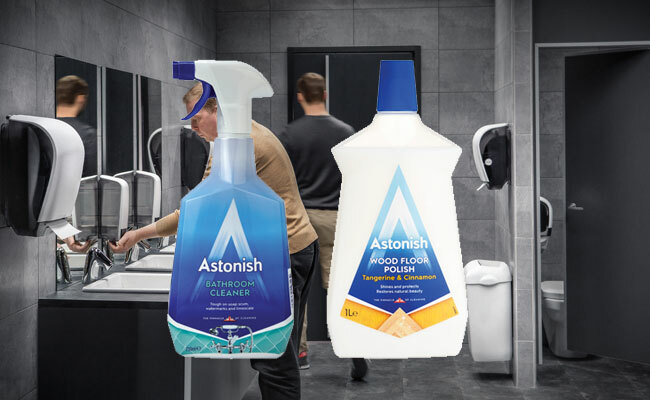 What's more all Astonish products are environmentally friendly and do not contain any ingredients that are harmful to the environment, helping you to keep a squeaky clean conscience as well as spotless premises. Astonish cleaners are ideal for homes and catered accommodation looking for an eco-friendly cleaner. Astonish cleaners can keep everything clean; from your floor to your oven! Buy your Astonish cleaners from Pattersons Cleaning Supplies and choose from a large range of eco cleaning products to ensure that your business has a thorough green ethos. At Pattersons Cleaning Supplies we stock a large range of cleaning chemicals and cleaning supplies to keep every aspect of your business or home spotless but if you wish to buy commercial environmentally friendly cleaning products our eco cleaning products is the one you need! If you have any questions buying Astonish cleaners wholesale or any of the eco-friendly cleaners we stock, email our team of cleaning product experts on web@pattersons.co.uk.